Our wait is over. 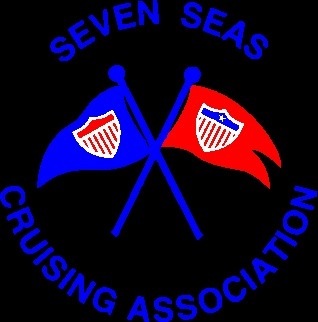 The winds are from the south and it’s time to go now raising anchor at 712am. New friends SV Sea Vu play and their friends have decided to go today after all. We raised the reefed Main Sail at 725am heading down Government Cut even though there were 3 cruise ships at dock, Phil decided to chance it, but not too long the police boat escorted us back the way we came and we had to go out the other channel around Dodge Island. The winds started out at SSE at 6kts but quickly increased once we were out of the channel by 825am to 14-15 kt from the south. The waves were choppy but once we got into deeper water, they smoothed out to 2-3 footers. By 845 am we put out a reefed head sail and doused the engine. We continued to sail at 6.7kts GPS until we entered the Gulf Stream about 1030am when we slowed down to between 5.5-6kts. This time the waters were NOT confused, but the seas gradually built to 3-4 ft as the winds did not moderate as predicted but increased until when we entered Bahamian waters about 340pm. We saw the famous turquoise blue waters and had a pod of 3 dolphins swimming along with us at the stern to greet us. By this time the winds started to clock SSE at 17-20kts. We had been taking spray into the cockpit all day, but it was too hot to have the side panels up to protect us. We started the engine at 354pm and rolled up the head sail as we wanted more stability with the quartering seas. I had been slightly sea sick most of the day taking 2 Marazine tablets. We continue at 6.9kt Boat speed with SOG 6.9 -8.4 kts By 545pm, we had finished dinner of warmed up ham, potato and cheese casserole. Finally the wind started to drop and we took down the main sail at 6pm before we didn’t have any more light as we started seeing lightning in the dark clouds north of us. It could get ugly. Would the squall hit us? Thankfully no. They stayed north and west of us. This is another time that we were glad we left as early as we did. SV Fugue left about an hour and a half behind us and got hit with the squall and a deluge of rain. We continued seeing the lightning in the clouds into the night until Phil came on watch at 1030pm. Then it got interesting. About 1130pm the front came through and in a matter of a few minutes the wind went from 10kt SW to 18-28kts from NW. We were rocking back and forth. The bad weather lasted about 1.5 hr then calmed down to 10 kts or less. By the time I came on at 2am, the waves had calmed down to residual swells and winds were 7-9kts for the NW. Our destination was to have been Bullocks Harbour, but it’s exposed to the NW winds, so we decided to go over Great Stirrup Cay and anchor in Great Harbor. 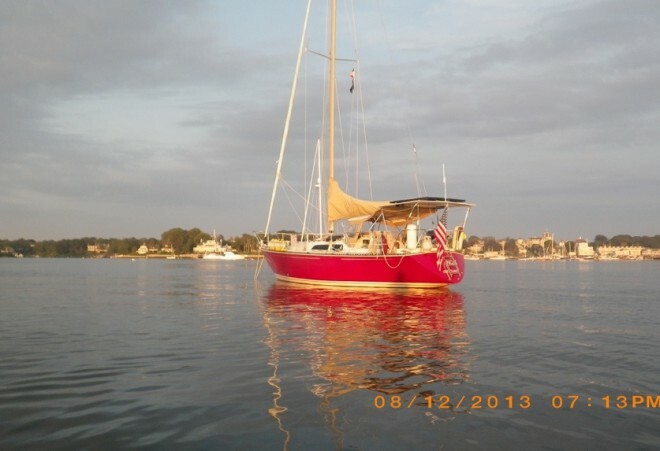 I woke Phil at 320am and we entered the wide calm cut to anchor with 2 other boats at 4am on December 16. After taking care of the logs, we went to bed. On a side note, these are the same days that we crossed over last trip. We went 134nm for this passage. Still being tired, I made a pasta sauce mix with chopped ham and carrots. No leftovers! We went to bed at 930pm, which is early for me. We are staying another day here at the Marina so that we can wash clothes to get all the salt out of them. I started that at 8am. Washing is a unique experience here. They have only one working washing machine. You push back a plastic lever I dude the broken controls to get it started, then used the provided water hose to fill it with warm water as the filling mechanism in the washing machine is too slow. Then after 12 Min (I timed it) the wash water has been spun out and you fill the washing machine with water again so it can start agitating for the rinse. It starts spinning and is done with a total time of 22 min. I really have to attend the dryer too. The one on the right doesn’t need a token as it always runs. I’ve been told to watch so it doesn’t burn up my clothes. It doesn’t do that, but it is hot and dries better than the one on the left. BTW it cost $5each to wash and dry a load of clothes, $10 total! We washed the Sunbrella cushion covers to clean and get out the salt water. They cleaned well! By 1030am I was all done and had the cushion covers hung up on lines Phil had strung. Then Phil made French toast for Breakfast. By 11 am we were on our way to the BTC (Bahamas Telephone Company) to buy SIM cards for our Bahamian cell phone and the 2 iPads. We can have 2Gb of data each month and bought $20 worth of minutes to start for the phone. So now we are set. I will save using the MJ phone when we have WiFi and use the iPad data for other things. Back at the boat Phil sponged down the deck while I washed inside the boat to get the salt off and then sprayed water on the vinyl windows in the Dodger and side windows. This morning we met Pat and Bridget McGraw on SV Kioni. She’s a WWSer but we didn’t realize that until late afternoon. Phil had wanted to walk to the beach, but we didn’t finish with the boat cleaning projects unto 330pm. We needed to take advantage of the extra water supply at $0.50/gal. Electricity is $0.75/kW. It’s nice that there is blue sky and sun today, but it is definitely hotter this trip. Ralph and Beverly on SV Fugue whom we met in Brunswick, GA pulled into the dock about 2pm. BTW they got the nice Customs agent and got 120days. After all the work was done, Phil and the guys were looking for 30A outlets but only 50A are available except for ours so Ralph is going without extra power today. The guys we re also talking about where to go next and when while us WWS’ers were taking about our past husbands and what we were going to do the next few days. It turns out that SV’s Kioni and Fugue are staying here tomorrow, which is the only day of the next 5 that you can travel anywhere before the east winds pipe up to the low 20’s. Phil and I have decided to go to somewhere south of Hoffman Cay between Devils Cay and White Cay and get in an area protected from the east winds and go fishing and hunting for lobster until we can sail to Nassau about 32nm away. We won’t have internet access there I expect but will when we are in Nassau. This entry was posted in 2013, Bahamas, Barry Islands, Cruising Friends, Great Harbour Cay Marina, Marinas, Passages and tagged boat projects, BTC, Crossing, cruise ships, Cruising friends, Gulf Stream, Marina, Passages. Bookmark the permalink. Phil & Lorraine- Congrats on your good crossing! Sounds like lots of work getting settled. I hope you two get to have some totally relaxing days. Enjoy the sunshine & warm temps – it’s been in the 20s here. It was, but now that we are in Little Harbour Cay in the Berry Islands, we’ll relax and fish and hunt for Lobster (Phil will do the last anyway). Happy to know you are safely across. Looking forward to hearing about all your adventures. Hope to post soon. Unexpectedly have cell phone signal so internet on iPad. Glad you are safely across. Continue to be safe. Looks like you will be going down to the Exumas. If you go to Nassau on the way;, west of Atlantis on Paradise Island, there is a great Ashram that welcomes visitors and has a great vegan lunch for cheap. It is like a time warp back into the 60s. Thanks for the info. Will take a look. Hi Lorraine – looking forward to following your adventure. Lauren (my daughter) and I just spent the last 3 days in Asheville, NC enjoying the Biltmore House (don’t know if you’ve ever heard about it). Just got back in town. Glad that you are following along. Phil and I saw Biltmore estate. It’s something. Glad that you both could see it.